Welcome to Old Glasgow Pubs. Due to popular demand Glasgow Pubs & Publicans has been re-printed . To order your copy Click here. Also available is Up & Doon the Gallowgate an A4 booklet detailing all the Public Houses, Taverns and Inns on the Gallowgate. To order your copy Click here. If you like this website why not watch a 20 minute video of Old Glasgow Pubs on youtube. Click here. If you like it please let me know. If you think this website has been useful PLEASE leave a DONATION. Glasgow pubs are more than just drinking establishments. They are historic landmarks, the focal points for special occasions and, in the past, the meeting places for the city's merchants, tobacco lords and many Glasgow societies. 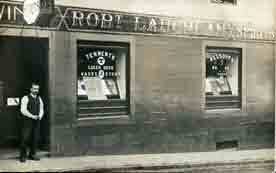 They are one of the oldest established businesses in Glasgow, occupying prominent sites throughout the city. In short, Glasgow's pubs are an important part of the city's rich cultural and architectural heritage. Hundreds of historic pubs have been lost following the City Council's extensive redevelopment programmes from the 1950s, this is why it is important that a web site has been brought together to record all those lost and forgotten pubs. This web site has been developed to record our local landmarks and to give a brief history on when the pub was established. The site will also record all the publicans who held the licence for the establishment and to record as much information on the pub as possible to insure that it will never be lost. So many of the local pubs in this great city have been demolished and the names of them have been forgotten, this site will hopefully bring back some good memories. 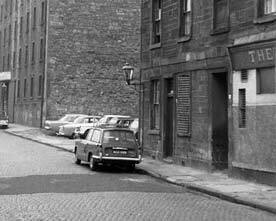 With your help we can name many of the forgotten pubs in Glasgow. For example can you remember the Shakespeare Bar on Raeberry Street, or do you known where these pubs were situated. Do you know the name of this pub on the right hand side of the image above ? The New Era Bar, Gorbals. Robert Lachlan, Wine & Spirit Merchant. Possibly 23 Church Street, Hamilton. For every good pub in the city, there has been a good publican. This web site will bring to light both what the Glasgow pub was like and what the publican's life was like. What hobbies did the landlord have and what societies he was a member of. What liquor was stocked in your favourite local and how much has the price of a pint and a nip of whisky changed over the years. All this will be answered in this great web site. Members of the Scottish Licensed Trade. 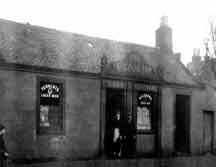 Although this web site has been developed mainly of the Glasgow pub and publican I have over the years collected a number of photographs and histories on pubs and publicans outside the city walls. These include Coatbridge, Hamilton, Wishaw, Cambuslang, Blantyre, Uddingston. As this web site develops pubs and publicans from all over Scotland will be included. Over the years I have collected a large number of pub fronts and interior photographs, these have been reduced in size to save web space. If you require a copy of any of the photographs in this site a small charge will be expected. As this web site develops into one of the largest collection of pubs and publicans, it would not grow in size if it wasn't for the input you give. If you have a story to tell about a pub or publican please get in touch. Something as simple as a name of a pub could bring back memories to some who has forgotten the name. If you have an old photograph even if it is only a few years old please get in touch and we will publish your image and information on this site. The site will regularly be updated with new photographs, stories with your help. Please leave a DONATION if you find anything on this website useful. Don't forget to Click on Up-To-Date News. The Gallowgate had at one time 86 public houses from Glasgow Cross to Parkhead Cross. Most of them sitting on a prominent corner. 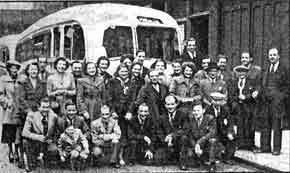 This meant there were more pubs on the Gallowgate than any other street in the city of Glasgow. A distance of around two and a quarter miles. There has been four Sarry Heids on the Gallowgate. The first one was built in 1755 the original Saracen Head Inn which was situated from Great Dovehill to Saracen Lane. 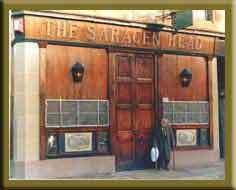 The second Saracen Head was situated on the other side of the road at the corner of St. Mungo Lane when the original Inn closed down. Many will remember an old pub that sat on the site called the Green Cellar. The third Saracen Head was opened when an extension was put up next to the original inn. This pub sat at the corner of Saracen Lane and was once owned by Angus Ross's relatives. In 1904 on the opposite side of Saracen Lane, where today's Saracen Head Bar stands today. The first licensee was a lady called Mrs McPhail. Angus Ross was probably the best known landlord who retired in 1992 and died shortly afterwards. 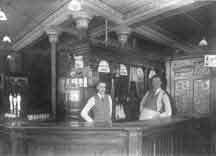 This is the interior of the Tower Bar, Helen Street, Govan.